After five months in Mexico, it was finally time to move on. 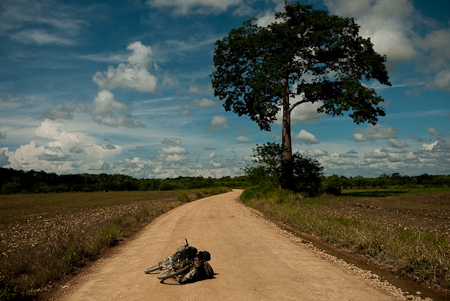 I was keen to ride off pavement again in Belize, having been inspired by a cycling couple’s dirt road adventures there six months ago. The fact that the rainy season has now begun wasn’t ideal, but I figured it was worth a try. 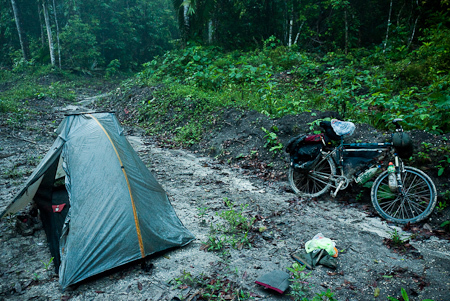 Luckily the three day traverse to the Guatemalan border turned out really well. It was a tough, remote ride. 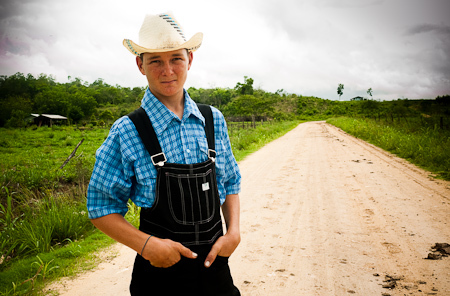 Once I’d passed boistrous Orange Walk Town, it was almost 100% dirt roads, passing through Mennonite communities, Mayan ruins and dense jungle, before emerging across a rope string bridge into colourful San Ignacio, 10 miles from the border with Guatemala. Beware, leaf cutter ants crossing. These little guys mean business too; they’ll happily snip through the ground sheet of a tent. I used to co-run a bike touring business in the Indian Himalayas. One of our drivers, Phunchok, a devout buddhist, always stopped to let animals and insects out of the way. I wonder what he would have handled this kind of road block. In fact, it was easy to get lost with all the farm tracks wending off in every direction. 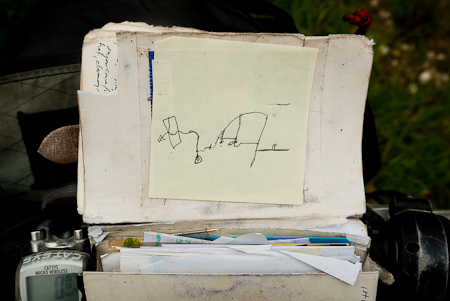 One of his neighbours, Jacob Harms, drew me what looked like a ‘stream of consciousness’ map on a Post It note. Jacob was sceptical I’d make it through the next part of the forest, so he invited me for dinner and a place to stay if I had to turn back. We chatted about what it is that draws people to travel so far from their homes. 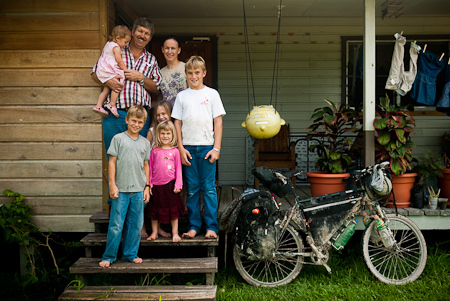 For Jacob, family life was all he could imagine wanting and he was genuinely curious about this nomadic cycling lifestyle. 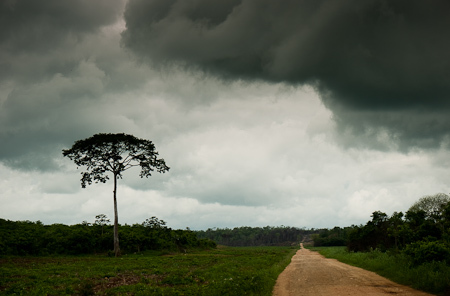 The rainy season brings with it brooding skies. 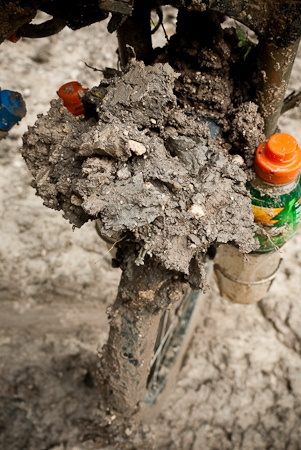 and mud… At this point, my bike was completely immobile. I couldn’t even lift it; with all that mud clogging the frame and sticking to my boots, it felt like everything weighed twice as much as normal. Somehow, I shuffled on, painstakingly slowly. Note to self – fit a rigid fork with massive clearances and disc brakes for the raining season. Sometimes it was clammy and overcast. 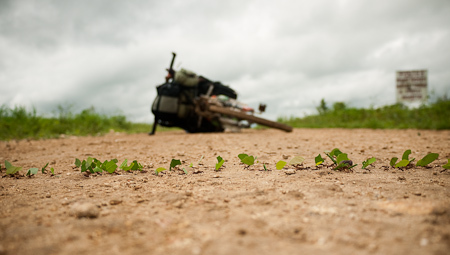 At other times, the scorching sun dried out the mud, and the road was smooth and fast. Impromptu friends. 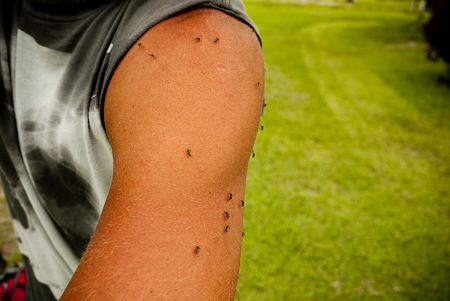 It seems the mosquitoes had been waiting for the nod from the raining season to get hatching. This posse pounced on my arm the moment I got out of my tent. 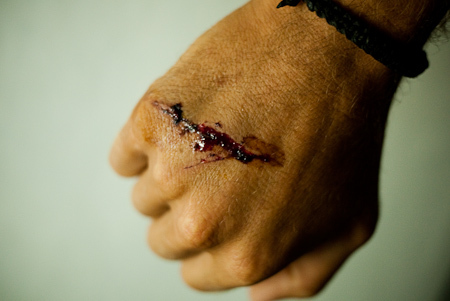 I’m also nursing this little wound, the result of my hand getting caught in a low fan in Chetumal… Mexico isn’t a land for tall people. Immediately noticeable the moment you cross the border is Belize’s rich ethnic diversity: Afro Carribean, Latin American, Chinese, Indian. Much of the architecture is wood-based and painted in bright colours faded by the sea air and the tropical rains. The energy also felt completety different from Mexico. While people were very friendly for the most part, there were certainly more than a few hustlers, I felt like I had to assert myself more. Over my brief visit, I met some real characters – Charles the boxer who was just out of prison, who spoke in time with the opening and closing of his scarred fists. Guys with massive afros who rolled by on their cruisers, calling out, ‘Hey mon!’ When I stopped at one house deep in the forest to check where I was, a man with unusually long finger and toenails eventually emerged, insistent that I could help him repair the radiator on his truck before he gave me directions. 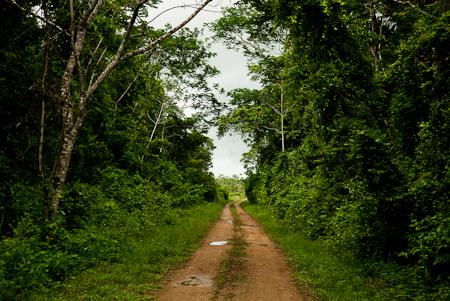 I was keen to avoid Belize City by taking a jungle route across the country, as the main roads here are narrow, and people drive fast. Otherwise, I’d have gladly stayed along the coast, as I liked the timewarped feel of the place. Old fashioned, hand painted billboards advertised businesses with evocative names: Tropic Air, Atlantic Bank. Perhaps a throwback to colonial times, most houses sported immaculate lawns. Plenty of houses had signs up advertising the sale of second hand clothes from their yards. What I hadn’t expected was the roadie cycling culture; I crossed several riders garbed in full lycra. But aside from a passing nod, they didn’t seem too keen to chat. Sugar cane season. 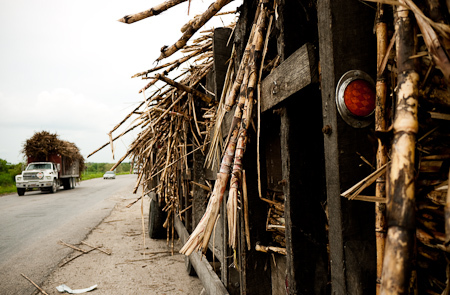 These massive trucks lumbered by, scattering shards of sugar cane in their wake. 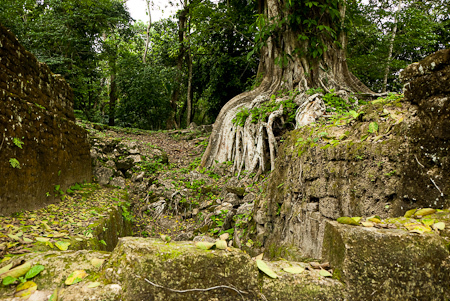 A 28 mile dirt track, potholed, dusty and hard work, led me to the ruins of Lamanai. I was the only one there. Camping there for the night, I chatted about life in Belize with the warden, Fernando, as we threw sticks into a plum tree to dislodge its fruit. 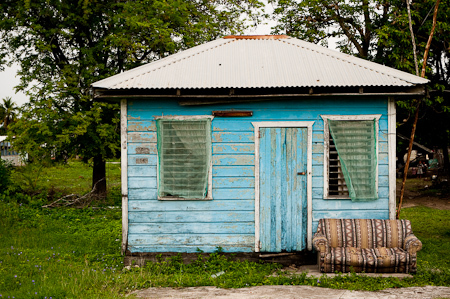 Apparently there have been several recent incidents of violent crime in Belize City, where people have been robbed of everything they own, including the clothes they were wearing. ‘What kind of life is it when a man needs to steal another man’s clothes?’ lamented Fernando. This in one of the jungle tracks I followed. Shortly after, a massive storm swept in, drenching me to the bone. It was invigorating. Having not seen a vehicle all day, I felt like I had the place to myself, enjoying the full brunt of a tropical downpour, stripping down to my shorts as I rode. I saw monkeys, deer, a puma and a kinkajou – or nightwalker, as they call them in Belize. 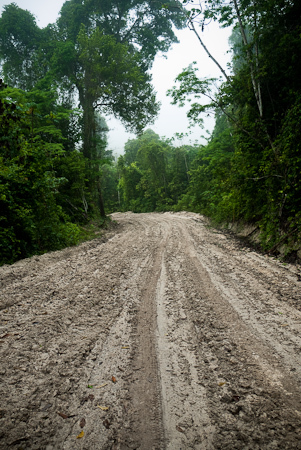 The closed road turned out to be the more direct one, but it did involve a couple of miles of this energy sapping mud. 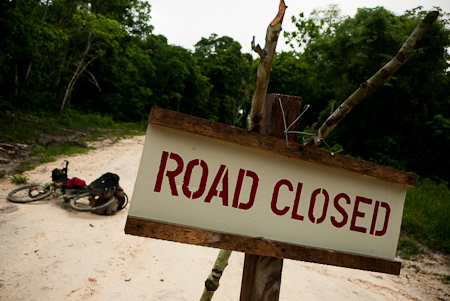 Oil had recently been discovered in the forest, and unfortunately trucks have been ripping the place up to extract it. At the next checkpost I met Denis, who invited me in for coffee. Denis was one of the most interesting individuals I’ve come across for some time, and we chatted easily for some time. His story was a troubled, crazy and personal one, but he’d managed to ‘break the cycle’ of the life he was caught up in, and buy himself a piece of land by the coast. There, he planned to grow organic fruit and vegetables on his land, since as he put it, ‘people always need to eat’. 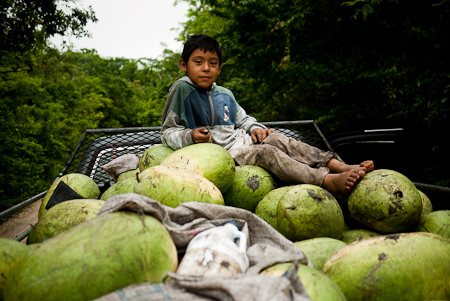 As I was nearing Buena Vista, this pickup piled high with massive watermelons passed by. I flagged it down, and tucked into one by the roadside, managing to polish off over a half before it defeated me. 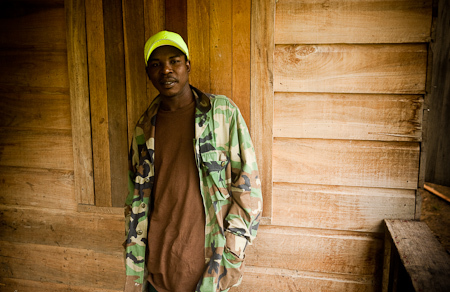 In the Mennonite community of Shipyard, I got chatting to Belize-born Hans. It turned out Hans was a dentist, and as my teeth had been really hurting again, he offered to give me a check up at his house! It was great to meet his family and get an insight into mennonite life; and I left with a bag full of mangos from the garden. 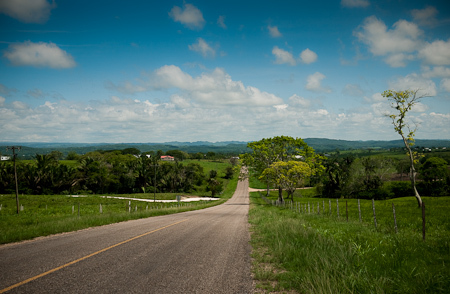 A brief stretch of paved road in Spanish Lookout before hitting dirt once more. 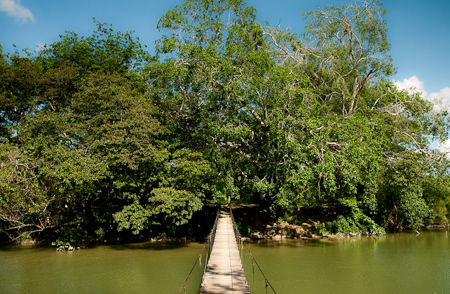 Just a couple of miles from San Ignacio, I took this rope string bridge. 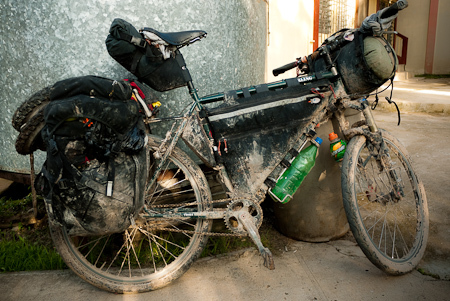 One muddy bike. My bottom bracket is now completely shot, so I’ll limping my way onwards until I can find a replacement. But for now, Guatemala awaits! 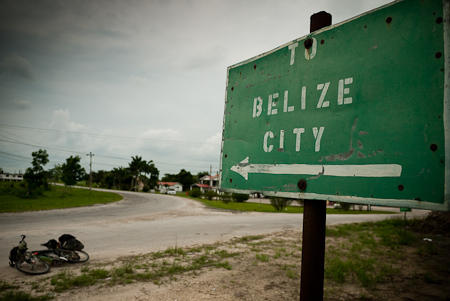 This entry was posted in Belize on June 3, 2010 by Cass Gilbert. It would seem the rainy season also brings more time for blogging; I’ve been loving the recent deluge of posts! Did Romain opt for the less muddy option this go around? You mentioned a rigid fork and disc brakes. As I’ll be hot on your heels starting June of ’11 I was wondering if any part of you wishes you would have started with that setup? Be well and thanks for the updates! I’m not sure. If I was riding a 29er, I’d definitely go for a rigid fork – but then I’d be facing tyre/rim replacement issues outside of N America. I’ve really enjoyed stopping off and mountain biking along the way, and the suspension fork has definitely been great for that. And useful on the rough tracks in the Sierra Madre. When I was riding with Jason and Anna, they both missed the lack of suspension on their bikes. So I guess it depends on what kind of riding you like. However, it’s not the first time I’ve had this mud clogging issue. The double brace of the Magura forks is supposed to stiffen them up, but it does mean they catch a lot of crud and snow. I’m looking at getting my hands on a set of On One forks (http://www.on-one.co.uk/i/q/FOOOCR26DV/on-one-cromo-26er-mtb-fork-v-brake–disc). They have massive clearances, so hopefully that will help, and aren’t too expensive. I have a friend coming out to join me, which would be an opportunity for a swap. I also had my front wheel built up with a disc hub, giving me the option of swapping out an Avid BB7 mechanical disc brake if need be, as I’ve occasionally had these kinds of problems on rides before. So yes, running a rigid fork with big clearances and fat tyres – 2.25s – is definitely an option, if you don’t mind compromising a bit when you go ‘proper’ mountain biking. And the bike should handle better fully loaded too. Thanks for the insight. My current thinking is to run high-volume 2.55s to offset the suspension fork; they’d be quite comfy on rutted gravel, etc. and could be easily swapped for slicks on longer paved stretches. It’s also what I currently run on singletrack, anyhow, though hasn’t been tested loaded. I like your wheel build idea allowing for both rim and disc brakes–simple, lightweight backup options could save a lot of hassle. I have a set of BB7s and may run disc up front and rim in the back. If I can get away without a front rack and panniers that whole rack compatibility dilemma would be adverted. 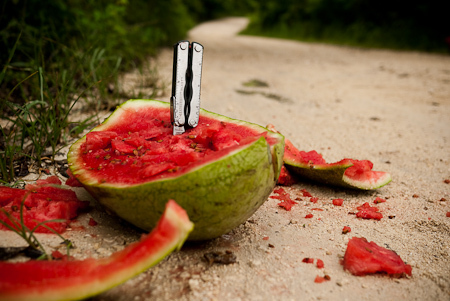 your blog is inspirational. I found it through dpreview.com. Are you taking your GF1 to belize or did you change your camera gear? Yes, I used the GF1 in Belize; it’s been my only camera since November last year. Every time I read about your recent adventures I feel my own adventure is a little more tame! But right now I’m glad to have finished Central America, enjoying the cooler weather in the mountains of Colombia. Just catching up on your adventures. Simply – awesome. I found your site through a friends’ site…your photos are wonderful! Which kind of camera do you have? It takes beautiful photos! It´s a panasonic GF1 micro four thirds camera. there´s a bunch of new, cheaper models out now from panasonic and olympus that should be very similar in picture quality, if not better. or check out the new sony NEX 3 and 5.